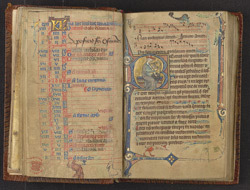 The small size of this Psalter suggests that it was intended to be carried about by the owner, rather than kept on a shelf or reading-desk. It has a medieval ownership inscription which shows that one (or two?) of its earliest owners were nuns of Holy Cross Monastery, Wherwell, a few miles south-east of Andover. The first page of the Psalms has an historiated Beatus initial depicting King David, the supposed author of the Psalms, playing his harp.